A regeneration product with exceptional detoxifying properties. It contains high-molecular humin acids, succinic acid, and silymarine. It acts well in the neutralisation or elimination of toxins from the gastrointestinal tract and adjacent tissues. A positive effect may be anticipated also in motor system conditions, arthroses and cases of bone and joint degeneration. - Humates uptake all substances with the highest chemical activity = toxins. - Most universal product (from elimination of toxic metabolites or free radicals to inflammatory joint conditions). - Prevention of all impairments associated with the ageing of the animal [Regavet]. - Intoxications (heavy metals) [Fytovet]. - Anti-inflammatory effect in the gastrointestinal tract - neutralisation of inflammatory mediators [Regavet]. - Attenuates tumour growth, prevents the formation of metastases – neutralisation of tumour growth stimulators [nourished by blood, carcinoma – Korovet, other tumours, sarcomas – Regavet]. - In purulent conditions – neutralises purulent products [Imunovet]. - Antiviral and antibacterial action (if the agent contains endotoxins) [Virovet, Kingvet]. - Tissue alkalisation, elimination of acidic metabolites, and hence elimination of fatigue [Fytovet]. - Inflammations of the eye, incl. corneal ulcerations (diluted). - Accelerates wound healing under the dressing – supports wound cleansing [Imunovet]. - May be used for washing and irrigations. - Severe auditory canal inflammations (diluted). In 1 capsule: Potassium humate (448mg), gelatine, silymarine (50mg), succinic acid (2mg). For external use, dissolve the contents of 1 capsule in 0.5 – 1 litre of boiled and cooled water. To facilitate swallowing it is advisable to dampen the capsule with water or cover it with fat before administration. May be administered in titbits. Where problems with intake are experienced, it is necessary to open the capsule by pulling it apart and to mix its contents ideally with foodstuff or dissolve it in drinking water. It is recommended to use the product within three months of opening. Do not exceed the recommended daily dose! Ensure sufficient intake of water in the course of product usage. Keep out of reach of children! Cytovet may reduce the effects of some medicinal products, such as cytostatic and chemotherapeutic agents. Store the product in dry and dark environment, at 10-25°C. Do not freeze. Minimum shelf-life specified on the box and on the label. 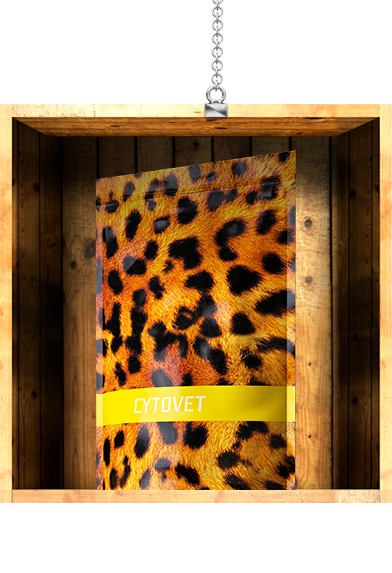 I use Cytovet for cases of enteritis, gastritis and colitis in combination with Regavet or Probiovet. May be used as an adjunct product for tumour diseases to increase the animal's life expectancy. In combination with Imunovet it may be used for local treatment of infected wounds and accelerated healing of extensive skin defects. The content of capsules may be dissolved in 500ml of water and then used for the irrigation of eyes; effective in the therapy of herpes-virus keratoconjunctivitis in cats and for various types of conjunctivitis for all animal species.